Microbiology is the study of microscopic organisms and how they interact with humans and the environment. Evaluate the science of basic microbiology; understand the fundamental aspects of microbiology. Microbiology focuses on organisms that are very small using various tools, which is a process done by microbiologists. As microbes are essential for human life and as microbes can cause human diseases, microbiology is therefore very important. The numbers of individual microbes and the number of microbes in and on the earth is staggering in proportions. quantitation: The process of quantitating. immunology: The branch of medicine that studies the body’s immune system. culturable: Able to be cultured (grown in a suitable environment). Microbiology is the study of microscopic organisms (microbes), which are defined as any living organism that is either a single cell (unicellular), a cell cluster, or has no cells at all (acellular). This includes eukaryotes, such as fungi and protists, and prokaryotes. Viruses and prions, though not strictly classed as living organisms, are also studied. 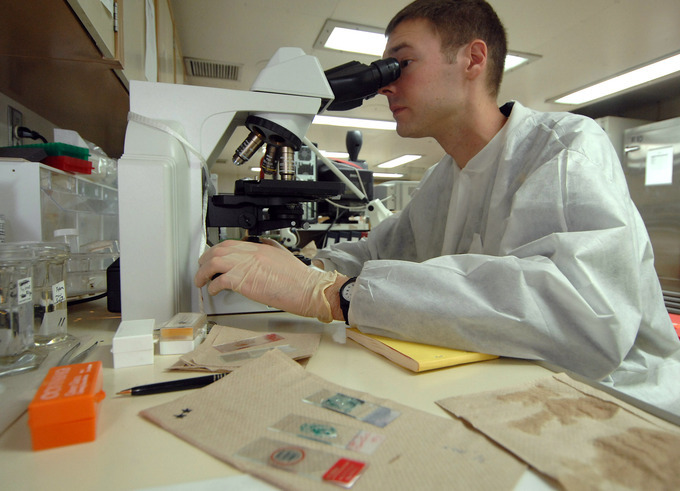 Microbiologist: A microbiology officer aboard a US naval ship examines wound cultures in the ship’s microbiology laboratory. Microbiology is a broad term which includes virology, mycology, parasitology, bacteriology, immunology, and other branches. A microbiologist is a specialist in microbiology and these related topics. Microbiological procedures usually must be aseptic and use a variety of tools such as light microscopes with a combination of stains and dyes. As microbes are absolutely required for most facets of human life (including the air we breathe and the food we eat) and are potential causes of many human diseases, microbiology is paramount for human society. Research in the microbiology field is expanding, and in the coming years, we should see the demand for microbiologists in the workforce increase. It is estimated that only about one percent of the microorganisms present in a given environmental sample are culturable and the number of bacterial cells and species on Earth is still not possible to be determined. Recent estimates indicate that this number might be extremely high at five to the power of thirty. Although microbes were directly observed over three hundred years ago, the precise determination, quantitation, and description of its functions is far from complete, given the overwhelming diversity detected by genetic and culture-independent means.